The Pasty ministry has a pasty bake twice a year for sale to the congregation, friends, and community members. This is a wonderful opportunity for fellowship and to fund special projects not covered in our general church budget. The Evansville United Methodist Church is having its winter pasty sale on Saturday, February 2, 2019! What is a pasty? 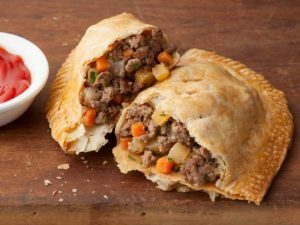 A pasty is a meat and veggie filling wrapped in pie dough. Our veggies include carrots, onions, potatoes and rutabagas. The meat is a mixture of both pork and beef. We also have veggie-only pasties available! Our made from scratch pasties are fully-baked, simply heat them up at home in the microwave or oven. They also freeze wonderfully and are perfect for those nights you are too tired to cook, but want a great tasting, hearty meal. We are selling both veggie-only pasties and meat and veggie pasties for $6 each. Contact the church office at (608) 882-4622 or via email to place your order. You can also use the sign up sheet at the back of the sanctuary during service. Please place your order by Monday, January 28, 2019 so we can be sure to order enough supplies. Pasties can be picked up after 12:00 noon and before 3:00 on Saturday, February 2, 2019 in Fellowship Hall at the Evansville United Methodist Church.